Their time has come. Appliances that soak up electricity from the grid when it is convenient, and stop feeding when the grid has limited capacity to meet other pressing demands. Efficient appliances are recognisable by energy-star ratings. There is no way to recognise a grid-friendly appliance. "Aren't more efficient appliances grid-friendly?" Well, no. At least not necessarily. A more efficient air-conditioner may only need 4 kilowatt-hours to do the same job that an earlier version required 5 kilowatt-hours to do. A 20 percent improvement. Now if the earlier version used 5 kilowatt-hours over a 24-hour period and the new model insists on receiving 4 kilowatt-hours all in one 30-minute gulp right in the middle of a peak demand period, then the more efficient air-conditioner is most definitely less grid-friendly than the previous model. "How exactly will grid-friendly appliances help?" Grid-friendly appliances first and foremost help to reduce the cost of supplying electricity by providing a flexible load. When extra generating and transmission capacity is unused during off-peak periods, grid-friendly appliances will provide a market instead of allowing that capacity to go unused. When the breeze suddenly drops and a wind-turbine farm output falls, the grid-friendly appliances will drop out and avoid the cost of backup generators to fill in. "What would make a good grid-friendly appliance?" An electric vehicle being recharged over an extended period from a smart power point is a good candidate for a grid-friendly appliance. It stays in its garage or parking spot connected to the electricity grid. It won't care if charging is deactivated from time to time, or that charging is enabled by an external signal when capacity becomes available. Another candidate would be an air-conditioning system that creates and stores a large quantity of ice that it makes whenever it is convenient for the grid to supply it with electricity. The air-conditioning of buildings and homes of the owners proceeds without interruption because only a very small amount of energy is needed to deliver cooling from the ice-store. A hot-water storage system is a similar candidate for a grid-friendly appliance. A heat pump is a more efficient hot-water system than a resistive heater, but both could be equally grid-friendly. "Do we need changes to market rules and standards?" There is some experience with market rules and standards that help identify where changes can assist in promoting grid-friendly appliances to achieve the objective of reducing the cost of energy. The energy-star rating standard that identifies energy-efficient appliances is a model that could be adapted for a new "grid-friendly rating" of appliances. The next examples point to a minor failing with an aspect of the electricity market: The disappearing price signal. A major electricity grid owner recognised a cause of inefficiency in the use of its infrastructure, and set a high price to send a clear price signal to encourage large energy consumers to remedy it. However, these energy consumers had supply contracts with retailers who just passed on the "price signal" from the grid owner but did not give the customers the information they needed to assess if they were able to do anything about responding to it. One customer looking for a solution to a completely different problem stumbled by serendipity upon this hidden price signal. The result: an immediate$10,000 investment by the customer in a device to solve the grid owner's legitimate concerns over inefficient grid use. The ensuing $5,000 reduction in the customer's annual electricity bill, was the intended response to the grid owner's "price signal". This example is written up in the post The other smart meter hazard. A similar situation is developing with "grid-unfriendly" appliances. Major electricity grid owners are proposing a "price signal" with dynamic charges to increase the cost of electricity during times of grid stress so consumers will be "persuaded" to turn off appliances. 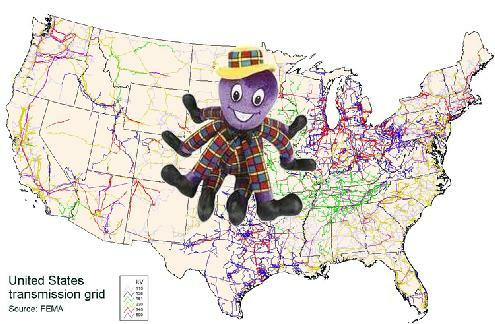 After one trial a grid owner considered that a dynamic charge of about 70 cents per kilowatt-hour is needed to get consumers to turn-off "grid-unfriendly" appliances. This trial is written up in the post Get Ready for Electricity at 70 cents per kWh. This proposal cannot begin until after the roll-out of smart meters in an enormously costly and time-consuming project. This approach was adopted by the former Victorian State Government in Australia. This is not exactly the same as the "disappearing price signal" example above. Instead it leaves consumers receiving the price signal, eventually, but being at a loss to find a satisfactory way to respond. It is also very expensive to install smart meters universally. This undermines the purpose which is to reduce the cost of delivering energy. 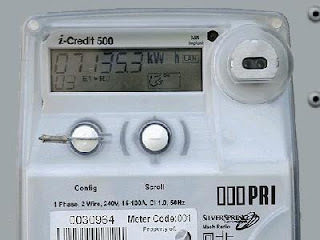 An alternate strategy with lower costs and inconvenience is to offer smart meters to consumers at the time they choose to install grid-friendly appliances. This allows Time Of Use (TOU) charges to reward these consumers with discounted energy for helping to reduce grid infrastructure costs: More carrot, less stick. All new and upgraded customer connections receive an interval meter. This includes new domestic dwellings as well as businesses. The Independent Pricing and Regulatory Tribunal (IPART), in its 2004 Determinations, facilitated this ToU program by allowing expenditure for meter replacement and modifying the pricing side constraints to allow ToU prices to be mandated. Ausgrid has rolled out interval meters to around 300,000 customers. By June 2014, it is anticipated that in the absence of a mandated Advanced Metering Infrastructure role-out, over 500,000 customers will have an interval meter installed in their premise, making it the largest deployment of interval meters in Australia. Ausgrid has completed a Strategic Pricing Study (SPS) that was designed to quantify how customers would respond to tariff reform initiatives such as Seasonal ToU and Dynamic Peak Pricing. A summary of the key results are shown in the following table. Domestic customers who sign up to the tariff respond well to dynamic tariffs, and are willing to reduce their air conditioning usage on hot days, despite popular belief to the contrary. The further away from the comfortable 18° to 22° Celsius range, the greater the demand response. Despite the apparent complexity of dynamic tariffs, customers are able to understand the concept. The dynamic price could probably be set at 50-70c/kWh and still achieve comparable reductions. The demand response to prices above $1/kWh appears to be saturated. 0-160MWh p.a. business customers showed no response to dynamic tariffs during the trial. It may be that they would respond to price signals over the longer term. While these results demonstrate that innovative network tariffs have the potential to play a role in demand management, more work is required to better understand the equity, economic, financial and regulatory implications of these tariffs. Ausgrid is planning to build on the results of the Strategic Pricing Study by launching a new tariff trial during the current regulatory period. The trial will examine a KW-based network tariff as a method of achieving demand response. As with any innovative tariff structure, an important part of this trial will be to better understand the acceptability of KW-based price signals to end-customers (and retailers). Submissions due 11 October 2012. "...managing consumer impacts and addressing the needs of consumers who could face increased financial difficulties under new pricing structures, and strengthening the arrangements for retailers and distributors to set cost reflective pricing..."
The AEMC Power of choice review is looking at possible changes to the National Electricity Market to help consumers better manage their energy consumption. The review is exploring what changes can be made to help families, business and industry make informed choices about the way they use electricity and manage their bills." 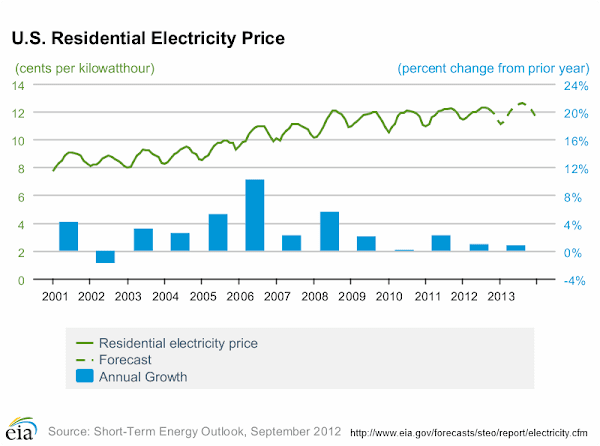 The residential price of electricity in the United States is 12 cents per kilowatt-hour. This is HALF the Australian price of 24 cents per kilowatt-hour. The United States has identified the reasons behind rising electricity costs and has overcome them. Peak demand has been growing very quickly. Australia's national electricity market rules encourage massive investment in grid infrastructure that is only used for a few hundred hours per year. Air conditioners are being installed at an increasing rate. Australia has opted for air-conditioners that increase peak demand for electricity. Peak demand is addressed by rewarding electricity consumers who are able to reduce their demand for electricity in peak periods. With NO massive investment in grid infrastructure to be used for just a few hundred hours per year, there is no need to double electricity prices to pay for it. The United States is installing air conditioning systems that shift the cooling load of buildings to off-peak periods. Air conditioners are energy hogs, so if you want to save money, go off peak. 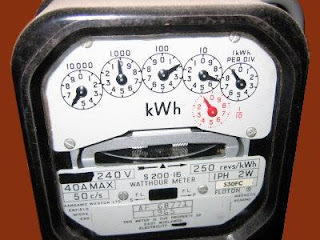 Of the differences between Analog Electricity Meters and Smart Meters, one is that Analog Meters cannot measure Power Factor. Smart Meters can. You cannot get billed for something that retail electricity suppliers cannot measure - YET. What the above Federal Court decision really means is: "You cannot get billed for something that retail electricity suppliers cannot measure - yet." DUOS: refers to Distribution Use Of System charges and relates to the use of the electricity distribution network. The new-found ability of retailers to measure power factor creates the opportunity to make these charges. 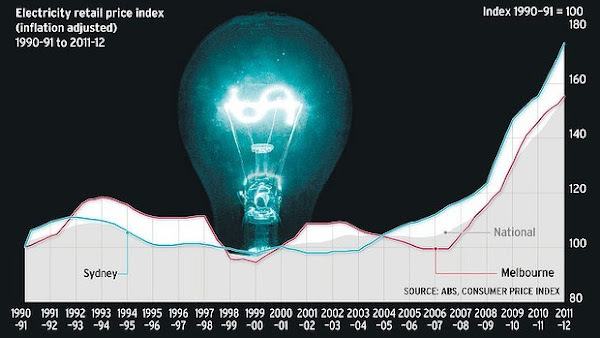 Of more importance to small business owners is that these electricity network charges are rising very rapidly. For instance, the monthly rate has increased from $6.04 to $10.23 per kVA on 1 July 2012. For a customer being billed for a peak of 160 kVA peak demand in a half-hour sometime in the last 12 months, this increases the monthly charge by $670.40 from $966.40 to $1,636.80. This is an INCREASE of more than $8,000 a year! This 70 percent increase has escaped the notice of all political parties, though it is similar in impact to the carbon price on small businesses hit with this sky-rocketing electricity network access expense. In the case of the carbon price the Federal Government has at least made some effort to provide advice on measures that may help reduce liability. More obviously can be done and needs to be done in this regard. Charges of $1,500 and more every month are made without these electricity retailers informing customers of the Power Factor measure on which the charge is based. 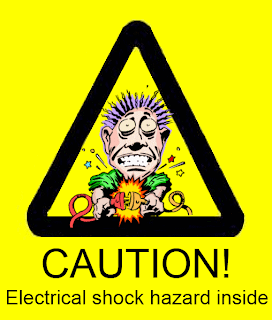 Though businesses may be able to reduce this expense that they are being hit with - now that electricity retailers have smart meters able to record power factor - many customers' electricity accounts do not even show them the power factor of their electricity use. This is vital information to manage a business's costs. For instance if a business owner is informed that they have a power factor of 0.7 - 0.8 they can examine the business-case for installing a Power Factor Correction device to raise the power factor to between 0.95 - 0.98. A business owner who can increase their power factor from 0.75 to 0.96 could cut a peak kVA network demand from 160 kVA to 125 kVA. This would slash their electricity bill by 35 kVA x $10.23 per month. This is a saving of $385.05 each month and $4,296.60 a year. You're invited to 'Make Your Home Energy Smart' - an event hosted by The Australian Alliance to Save Energy and the City of Melbourne. The City of Melbourne will launch the Go 5 campaign on the night. This initiative gives residents information about how much energy an average home uses and helps them reduce their electricity consumption to 5kWh of power use per person per day (or better!). Chris Dunstan, CEO of the Australian Alliance to Save Energy, will be discussing what is driving up energy prices and what residents can do about it.